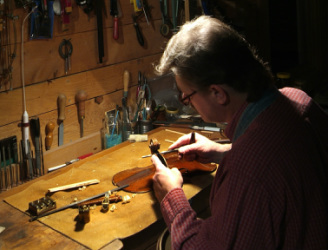 Danny Bishop, owner and proprietor of Fiddle & Fret, is an accomplished luthier and musician. He has a lifetime of experience and passion for music and musical instruments. He has apprenticed and mentored under several top luthiers through the years where he learned to repair and adjust fine instruments. In 1997, Bishop started his own business in Asheville, NC which has developed into what is now Fiddle & Fret. Today he continues to restore stringed instruments and carries dealerships of several fine custom instrument makers. He also has a vast knowledge and expertise in vintage instruments and offers an ever changing inventory of these as well. Feel free to inquire about what may be in the vault! Fiddle & Fret is located just outside Asheville, NC.